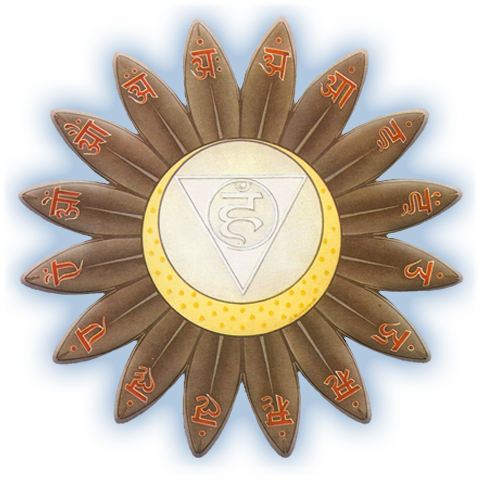 Wishuddha is the first of the three Chakras which reside on a spiritual plane. It is associated with the faculty of higher discrimination, between choosing what is right and wrong, and it is associated with creativity and self-expression. It is about all that we put out into the world, the vibrational level by which we express ourselves. It is said that when this chakra is closed, we undergo decay and death, but when it is open, negative experience is transformed into wisdom and learning. Meditation upon this chakra is said to bring about Siddhis, the capability, perfection or attainment, of occult powers like vision of the three periods (worlds), “past”, “present” and “future”. It also brings freedom from disease and old age and the ability to move the three worlds. It is positioned at the neck region. The color is said to be sky-blue (smoke transparent) and is associated with the element Space (Akasha). The primordial sound, “om” consists of two pure sounds, the O and M. From this primordial sound emanated the sixteen pure vowels which reside in Wishuddha. The petals correspond to the functions of the mantra Ong [Aum], the Sama-mantras, the mantra Hung, the mantra Phat, the mantra Washat, the mantra Swadha, the mantra Swaha, the mantra Namak, the nectar Amrita, and then the seven musical tones. The souls desire is to be heard and understood and to speak and hear the Truth. Lies are toxic to the Fifth Chakra. We must learn to speak the truth without harming the self or others.